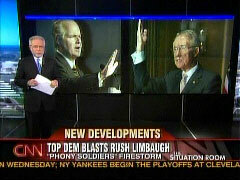 CNN's Wolf Blitzer on Monday night matched MSNBC in distorting the target of Rush Limbaugh's “phony soldiers” comment as the 7pm EDT hour of The Situation Room devoted a full story to Senate Majority Leader Harry Reid's attack on Limbaugh based on a Friday hit job on Limbaugh by the far-left Media Matters. 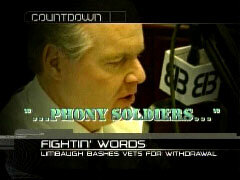 “It's an angry new shot in the dispute over the war in Iraq,” Blitzer asserted before reporting that Limbaugh had charged “that some veterans who are criticizing the war are, in his words, quote, 'phony soldiers.'" In fact, on his show Friday and Monday, Limbaugh made clear he was referring to those who claimed to be soldiers, but never served, a point mentioned by reporter Dana Bash, but only after Blitzer framed the story by adopting as fact the spin of the left wing attack group. 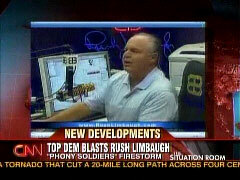 Frankly, I'm disappointed in Blitzer who is usually a better journalist who, if he really felt Reid's rant was newsworthy, could have at least set up the story by giving equal weight to Limbaugh's explanation for the intent of the “phony soldiers” remark as to the derisive spin pushed by political enemies of Limbaugh. More like its been “simmering” amongst a very small group of liberal activists. All day Friday, even after Rush Limbaugh corrected the misinformation, MSNBC promoted a story fed to them by the far-left Media Matters about how Rush Limbaugh had called military personnel who served in Iraq and oppose the war “phony soldiers.” Limbaugh opened his noon EDT radio show on Friday by explaining how he was referring not to any real soldier but a phony one, notably Jesse MacBeth, who became a hero to the left when he recounted how his Army unit murdered innocent Iraqis. In fact, he hadn't even completed basic training. WOLF BLITZER: Tonight, a top Democrat is coming out guns blazing against conservative radio talk show host Rush Limbaugh. It's an angry new shot in the dispute over the war in Iraq and Limbaugh's charge that some veterans who are criticizing the war are, in his words, quote, “phony soldiers.” Our congressional correspondent, Dana Bash, is watching all of this unfold. Dana, the Senate Majority Leader, Harry Reid, he took this straight to the Senate floor today. 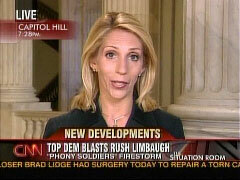 DANA BASH: He sure did and Senator Harry Reid is part of this controversy now that Rush Limbaugh calls a Democratic campaign to smear him. But Senator Reid made clear today that he was using this controversy to, in his words, to make clear that “neither party holds a patent on patriotism.” The Senate Majority Leader took the floor and took, aim not across the aisle or at the President, but at a conservative radio host. SENATOR HARRY REID ON THE SENATE FLOOR: Rush Limbaugh took it upon himself to attack the courage and character of those fighting and dying for him and for all of us. Rush Limbaugh got himself a deferment from serving when he was a young man. BASH: Harry Reid combined a biting attack on Limbaugh with a demand for an apology for what Democrats call an insulting rant against soldiers who joined Democrats in opposing the war. Limbaugh spoke with a caller last week. BASH: Limbaugh insists he was only talking about one anti-war soldier, Jesse MacBeth recently convicted of falsely claiming to have served in Iraq. But Limbaugh's comments are burning up the liberal blogosphere. 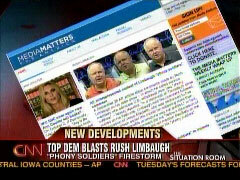 Watchdog group Media Matters, among the first to blast Limbaugh, says it doesn't buy his explanation. And this new escalation of the Iraq debate has Democrats looking to turn the tables after the controversy of MoveOn.org's attack on the commanding General in Iraq. REID ON THE SENATE FLOOR: If we take the Republicans' side at their word that last week's wote on another controversial statement related to the war was truly without patriotism, not politics, the I have no doubt that they will stand with us against Limbaugh's comments. BASH: Now Limbaugh accused Democrats of engaging in McCarthyism and he even alluded to a quote used against Senator Joseph McCarthy himself as Limbaugh said, “have you no decency left, have you no shame whatsoever?” Now a spokesman for Senator Reid responded in kind with a quote from Edward R. Murrow. Wolf, that quote, “we must not confuse dissent with disloyalty.” Wolf. BLITZER: I guess this battle's going to continue for some time, Dana. Thanks very much.